LiveCode LessonsLiveCode LessonsHow To - Step-By-Step Guides To Tasks In LiveCode Working with filesHow do I get the content of a URL on a web server into LiveCode? 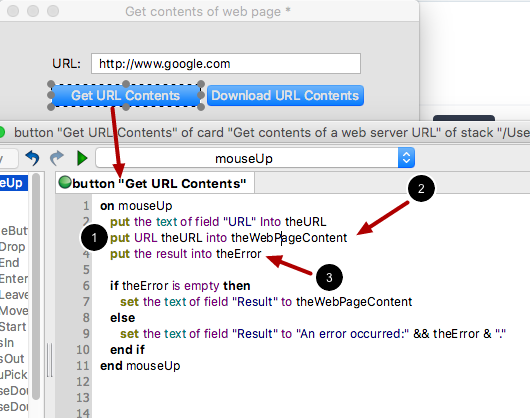 This lesson will show you how to load the content of a URL into LiveCode. This lesson will show you two techniques for loading the content of a URL into LiveCode. In this screenshot you see that the content of http://www.google.com (1) has been loaded into a LiveCode field object (2). 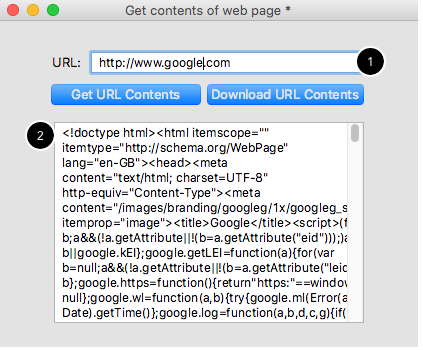 First we will look at how to download a URL using the put command. In particular we will use the put URL form (1). put URL is an easy way to synchronously download a URL into LiveCode. You just provide a URL and LiveCode will download the URL contents and store them. In this case the contents are being stored in the variable theWebPageContent (2). The fact that put URL is synchronous means that your LiveCode code will not continue executing until the URL has finished downloading. For URLs that take a long time to download your UI will become unresponsive until the download process is complete. Because of this we can check for any errors that may have occurred while downloading the URL right after the put URL line (3). set the text of field "Result" to "An error occurred:" && theError & "." Now we will look at how to download a URL using the load command (1). The load command requires a little more work than using put URL but has the added benefit of being an asynchronous action. The fact that load is asynchronous means that your LiveCode will continue executing while the URL is being downloaded. For long download operations your application will remain responsive. When calling an asynchronous command we cannot get the results of the download operation right after making the call. Instead we make use of a feature in LiveCode called callbacks. A callback is a message that will be sent when the load operation has finished. 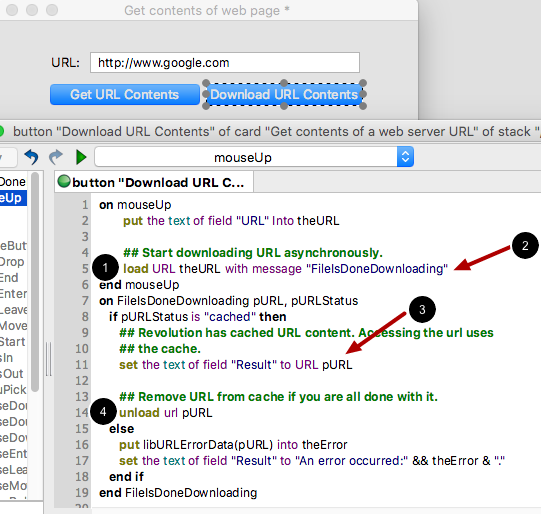 In this example we tell LiveCode that the message FileIsDoneDownloading should be sent when the url finishes downloading (2). When the FileIsDoneDownloading message is sent by the engine we can get the contents of the URL. LiveCode actually caches the contents of the URL on the computer so that the next time you access the URL the cached data is returned (3). When we no longer need the URL contents any longer we clear the cache by calling unload url (4). ## Start downloading URL asynchronously. load URL theURL with message "FileIsDoneDownloading"
## Remove URL from cache if you are all done with it. Prev: How do I export a csv file? This will work on mobile or desktop, on desktop google maps will be opened in your default browser.